Cutt D, Signal T & Taylor N (2015) Mandated reporting of suspected animal harm by Australian veterinarians: community attitudes. Anthrozoos 28:3 437-447. Arluke, A., Levin, J., Luke, C., & Ascione, F. (1999). The relationship of animal abuse to violence and other forms of antisocial behavior. Journal of Interpersonal Violence, 14, 963-975. Ascione, F.R. (1998). Battered women’s reports of their partners’ and their children’s cruelty to animals. Journal of Emotional Abuse, 1, 119-133. Ascione, F.R., Friedrich, W.N., Heath, J., & Hayashi, K. (2003). Cruelty to animals in normative, sexually abused, and outpatient psychiatric samples of 6- to 12-year-old children: Relations to maltreatment and exposure to domestic violence. Anthrozoos , 16, 195-211. Ascione, F.R., Weber, C.V., Thompson, T.M., Heath, J., Maruyama, M., & Hayashi, K. (2007). Battered pets and domestic violence: Animal abuse reported by women experiencing intimate violence and by nonabused women. Violence Against Women, 13, 354-373. Baldry, A. (2003). Animal abuse and exposure to interparental violence in Italian youth. Journal of Interpersonal Violence, 18, 258-281. Becker F & French L (2004) Making the link: Child abuse, animal cruelty and domestic violence. Child Abuse Review 13: 399-414. Boat, B.W. (1995). Commentary: The relationship between violence to children and violence to animals. Journal of Interpersonal Violence, 10, 229-235. Carlisle-Frank, P., Frank, J.M., & Nielsen, L. (2004). Selective battering of the family pet. Anthrozoos, 17, 26-41. Currie, C.L. (2005). Animal cruelty by children exposed to domestic violence. Child Abuse & Neglect, 30, 425-435. Dadds, M.R., Whiting, C., & Hawes, D. (2006). Associations among cruelty to animals, family conflict, and psychopathic traits in childhood. Journal of Interpersonal Violence, 21, 411-429. 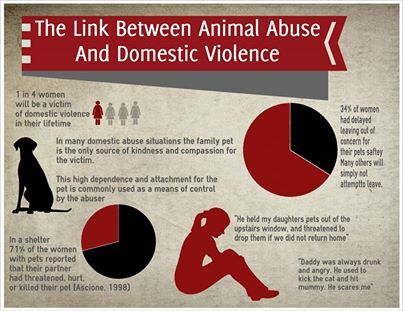 DeGue S & DiLillo D (2008) Is animal cruelty a ‘red flag’ for family violence? Investigating co-occurring violence toward children, partners and pets. Journal of Interpersonal Violence 24(6): 1036-1056. DeViney, E., Dickert, J., & Lockwood, R. (1983). The care of pets within child abusing families . International Journal for the Study of Animal Problems, 4, 321-329. Duncan, A., Thomas, J.C., & Miller, C. (2005). Significance of family risk factors in development of childhood animal cruelty in adolescent boys with conduct problems. Journal of Family Violence, 20, 235-239. Faver, C.A., & Strand, E.B. (2003). To leave or to stay? Battered women’s concern for vulnerable pets. Journal of Interpersonal Violence, 18, 1367-1377. Fawcett NR, Gullone E and Johnson J. (2002) The relationship between animal abuse and domestic violence: implications for animal welfare agencies and domestic violence organisations. Domestic Violence Clearinghouse Newsletter, Issue 10 (March), 4-7. Fitzgerald AJ (2007) “They gave me a reason to live”: The protective effects of companion animals on the suicidality of abused women. Humanity and Society 31: 355-378. Flynn, C.P. (2000). Why family professionals can no longer ignore violence toward animals. Family Relations, 49, 87-95.